Since I recently discussed dog poop at great (and gross!) length, I decided I should give dog urine its due. Urine, of course, is the end product of a filtering process that removes waste products and metabolic end products from your pet’s blood. There’s actually much that can be learned about your dog’s health by evaluating several aspects of his urine. Kidneys contain nephrons that are comprised of the glomerulus, which acts as a filtration unit, and the tubule, which modifies the filtrate (waste products). The filtrate passes out of the kidneys through the ureters into the bladder, where it is stored until it is excreted from the body through the urethra. The urine that is excreted from your dog’s body contains sediment that reflects the health of all the cells and structures of the urinary tract. A complete urinalysis measures the function of the nephrons, and gives information about the animal’s metabolic and fluid status. The test is also used to evaluate substances in the urine that might indicate an underlying disease process. What Color Is Your Dog’s Pee? The color you want your dog’s urine to be is clear to light yellow. This means she is well-hydrated. You do want to see some yellow in there, because pee that looks consistently like water with no yellow at all is a sign that your dog is drinking too much water or is unable to concentrate her urine. Water intoxication can lead to a very serious condition called hyponatremia (excessively low sodium levels), which is a rare but frequently fatal condition in dogs. More commonly, dogs over-hydrate due to thirst brought on by a problem with the kidneys. If your dog is drinking so much water that her urine is clear most or all of the time, you should make an appointment with your veterinarian. If your dog’s pee is a bright or dark yellow, he is very likely dehydrated or having another medical problem. This can occur from lack of an adequate supply of drinking water, or because he is sick, in which case it’s also time for a visit to your vet. Make sure your pet has fresh, clean, filtered drinking water available at all times, and if he refuses to drink or the color of his urine doesn’t improve, it’s time to call your veterinarian. I never suggest adding anything into your pet’s drinking water except homeopathic remedies or flower essences (which are tasteless), as other additions (vinegar, medications, herbal tinctures, or nutraceuticals) can cause the water to have an unpalatable taste and pets may not consume as much water as they need. If your dog’s pee is any color other than clear or yellow – if it appears brown, orange, or reddish-pink, for example – it is cause for concern. Brown or orange urine can indicate the presence of a protein called myoglobin, which is released by your dog’s muscles when they are stressed or injured. If your pet’s liver is producing too much bilirubin it will be excreted in urine, turning the urine brown. Old blood in the urinary tract from a past kidney infection, stones in the kidneys or bladder, a bladder infection, or a tumor, can also give urine a brown tinge. If your dog’s pee takes on a pink or red color, it indicates current bleeding due to one or more of the conditions just mentioned, or some other serious problem. Obviously, if your dog’s urine is any color other than clear or yellow, you should seek help immediately from your veterinarian. Your veterinarian will use a test called a urinalysis to assess the overall health of your dog’s urinary tract, including the kidneys and bladder, and to check for other health indicators such as glucose regulation and liver function. I recommend a yearly urinalysis for all pets, and more frequent testing for older animals and those with chronic health conditions. Many veterinarians prefer to collect sterile urine samples from their patients using a diagnostic procedure called cystocentesis. A small needle attached to a syringe is inserted directly into the bladder wall to collect the sample. Urine samples obtained this way avoid contamination with debris from the animal’s genitalia and believe it or not, are typically pain free for cats. Collecting a sterile sample from a dog is significantly easier using other methods than collecting one from a cat, so I save cystocentesis primarily for cats, who don’t seem to mind. In my experience, dogs seem to mind the procedure a lot more than cats. Since the “gold standard” for human urine bacterial cultures calls for sterile samples that the patients themselves provide (otherwise known as “pee in the cup please”), I don’t see a reason to put dogs through a potentially painful experience when research shows a cystocentesis does not provide any more information than a collected sterile sample. For this reason, I just send home sterile specimen cups with all my dog owners. A last-ditch option is to collect urine via catheterization, as not only is this uncomfortable for the pet, but the potential to cause a secondary infection is significant. Under no circumstances (except when a patient is paralyzed) should veterinary staff attempt to squeeze your dog’s bladder to collect a urine sample, as this can be quite painful and can cause injury to the bladder. Urine samples are best analyzed within 30 minutes of collection, but no more than 2 hours for an unrefrigerated sample, or 6 hours if the sample has been refrigerated. The timing of the actual sample collection isn’t important unless your veterinarian wants to assess your dog’s ability to concentrate urine or to check cortisol levels if Cushing’s disease is suspected. In these cases, a first morning urine sample is needed. All urine samples collected for culture and sensitivity testing when a potential urinary tract infection is suspected should be collected in a sterile specimen cup and delivered to the veterinary clinic immediately for the most accurate test results. 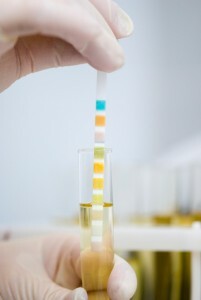 The first test of a urine sample is a visual examination. Your veterinarian will note the color of the urine as described earlier, and whether or not it is cloudy, which may suggest an infection or the presence of protein. The color and clarity of the urine is important because in some cases it can adversely affect the next phase of testing, the dipstick test. For example, if the sample is bright red in color, it can falsely elevate the dipstick readings for protein, acidity, and specific gravity. Acidity (pH). The pH level indicates the acidity of the urine. In healthy dogs, urine pH should be in the 6.0 to 6.5 range. Specific gravity. This is a measure of your dog’s urine concentration, which is a measure of kidney function. Urine can be very dilute or very concentrated. Dilute urine (low specific gravity) is the color of water, whereas concentrated urine (high specific gravity) is bright or dark yellow. It’s important to know that a healthy dog’s urine specific gravity will vary throughout the day depending on her activity level and the amount of water she’s drinking. Protein. Protein isn’t a normal component of urine, so a positive dipstick test for protein may indicate a bacterial infection, a problem with the kidneys, or blood in the urine. If your pet is passing protein, ask your vet to complete a urine protein to creatinine ratio (UPC) or microalbuminuria (MA) level to quantitatively determine how much protein is being passed. Sugar. Sugar is also not normally found in urine. Its presence signals the possibility of diabetes mellitus. Ketones. Ketones are byproducts produced by the cells of your dog’s body when they aren’t receiving adequate energy in the form of nutrients. Ketones in the urine are another red flag for diabetes. Bilirubin. Bilirubinuria (bilirubin in urine) is a sign that red blood cells are being destroyed at a higher-than-normal rate. The condition exists in dogs with liver disorders and autoimmune disease. It’s important to note that blood in the urine from a bladder infection can stain the bilirubin pad on the dipstick, causing a false reading for potential liver disease. Blood. The dipstick test will pick up the presence of red blood cells or other components of blood in urine. This finding should always lead to a microscopic evaluation of the urine to check for infection, inflammation, or bladder or kidney stones. Another test that should be performed on your dog’s urine sample is a microscopic evaluation of urine sediment. This is accomplished by putting the urine in a centrifuge, which ultimately deposits any cells or other abnormalities (the urine sediment) in the bottom of the test tube where they can be collected and evaluated under a microscope. White blood cells. The presence of white blood cells can be a sign of an infection or inflammation in the bladder or kidneys. Red blood cells. Red blood cells in urine sediment may indicate trauma or irritation to the bladder wall or kidneys, and are commonly found in dogs with bladder or kidney infections or stones, interstitial cystitis (inflammation of the bladder lining), and cancer in the urinary tract. Bacteria. Bacteria in urine sediment can be a sign of infection, however, if no bacteria is seen in the sediment, it doesn’t rule out an infection in the bladder or kidney if bacteria was found in the urine sample itself. You should always request a urine culture for clarification if the sediment does not support a diagnosis of a urinary tract infection and your pet is showing classic symptoms, such as urinating more frequently or pain on urination. Likewise, if the sample was not collected in a sterile specimen cup provided by the veterinary clinic, there could be bacterial contaminants that may prompt your vet to prescribe unnecessary antibiotics. If your vet thinks there may be a bladder infection present, always insist on a culture as proof of infection, and to insure the appropriate treatment is given. Casts. Casts are the interior lining of cells found in the tubes of the kidneys, and when they show up in urine sediment, they are a sign of a problem with the kidneys such as infection, inflammation. or an ingested toxin. Crystals. Crystals in your dog’s urine generally occur when the urine pH is out of range, or when bacteria is present. Atypical cells. Pets with bladder tumors occasionally shed atypical cells into their urine, as well as animals with irritated bladder walls. Hopefully I’ve given you some valuable information today about why your dog’s urine is an important measure of her health. There are some additional tests that can also be performed on a urine sample that aren’t routinely a part of a basic urinalysis, including the Bladder Tumor Antigen test.